Good morning friends! 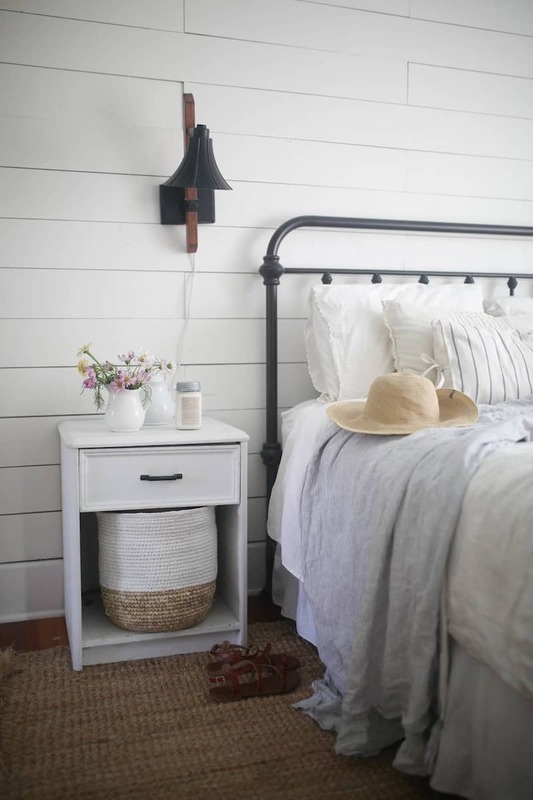 Today I’m sharing some farmhouse bedroom inspiration. I love the bright whites, planked walls, and antique decor present in this style. It’s laid-back yet full of charm. If you are hoping to do a budget-friendly refresh of any room then the farmhouse style is a great decor choice to save a little money. Furniture you already own can be painted white and distressed. A diy shiplap wall can be accomplished over a weekend, even with minimal building know-how. And ticking pillows or bedding can be handmade (far less expensively than store-bought pillows!) in just an afternoon or two. Instead of investing in pricey brand-new decor, you can also take the opportunity to showcase some of those antiques or family heirlooms that you may have collected over the years. I’m sharing three of my favorite farmhouse bedrooms plus a round up of some amazing pieces (scroll to the end for sources) for inspiration today. 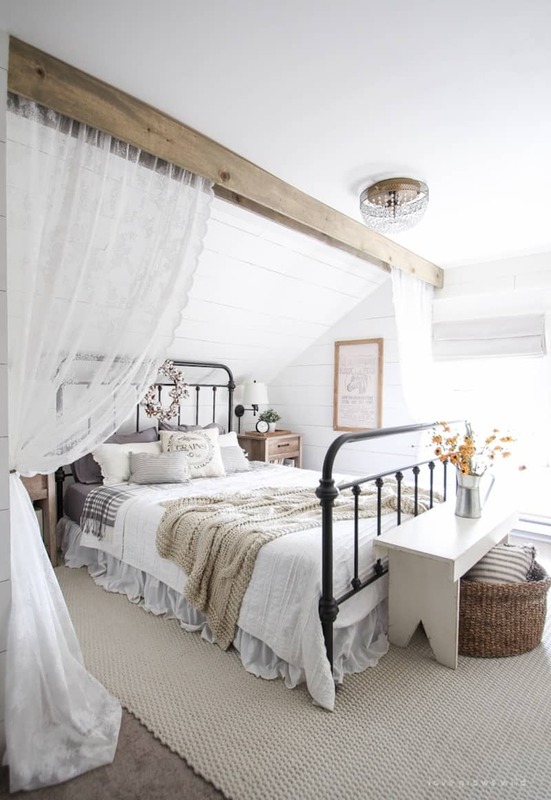 I think you’ll find that these spaces can serve as an idea springboard for your own farmhouse bedroom. 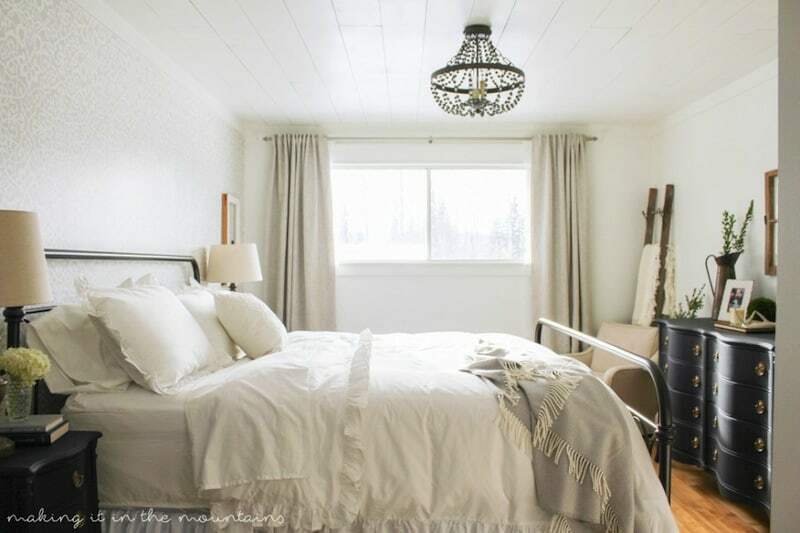 This bedroom from Lisa at Farmhouse on Boone is one of my favorites. Lisa makes a farmhouse statement with key pieces that embody the farmhouse look. Planked walls, dark light fixtures, and the natural rug give the space character without being over-the-top. The handmade throw and pillows on the bed also add plenty of charm. 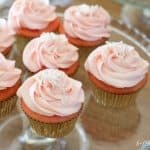 Lisa has tutorials for these handmade goodies on her site, so go check it out if you love this look! Kristi did an absolutely amazing job with this bedroom update. I definitely suggesting clicking over to her site to get a closer look at the wall behind the bed. It is stenciled and adds so much dimension and character to the room! I also love how she planked the ceiling. Gorgeous textures throughout. The dresser and nightstands plus the flush mount chandelier give the space a very pretty romantic feel. I mean, who hasn’t seen this gorgeous bedroom on Pinterest? From the amazing curtain treatment to the layered bedding, every detail in this room is perfection. I love how Liz planned each element to serve a clear purpose in the room. The curtain treatment makes this room quite feminine, but I think if you were to eliminate it and just simply frame the window with drop cloth curtains, it will play the feminine side down a bit. Also, I want to note that for those of us who don’t have hardwood floors (sadness! ), check out the edges of this photo. Yep, a nice big rug can cover carpet and allow you to pursue the farmhouse look, even without the seemingly requisite hardwoods. Definitely something to keep in mind! 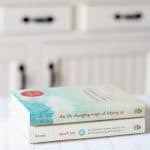 If you’re really needing to stick within a tight budget, it can help to choose only one or two areas to change and then go from there when the budget allows. This list boils down the look in these rooms to some key areas, and I would suggest picking a few of these to update and then add on to that as you can. For instance, perhaps start with a nice coat of white paint on the walls (and outdated furniture!) and add a statement shiplap wall. Next, sew up a couple ticking pillows and update your light fixture. Or, start even smaller and just change out your bedding for something light and bright and add in some ticking fabric accents. Use this list to get started and choose some areas to focus on! Of course, this post just wouldn’t be complete without some shopping to do! 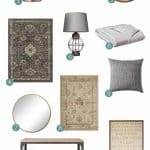 I compiled this list based on products I came across that would help me get the farmhouse bedroom look in my own home and I think you will find them helpful as well.